This beautiful Talavera ridged vase is a perfect decorative accent to any niche, table or mantle in your Mexican inspired home. 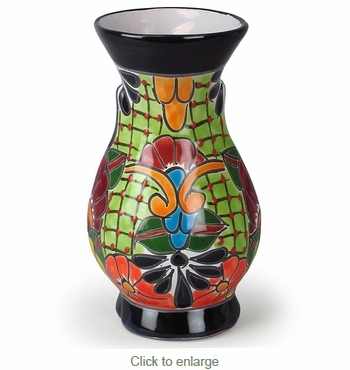 Colorful Talavera pottery will enhance many interior themes including Santa Fe, Spanish colonial, or southwest. Each piece of Talavera pottery is handmade and hand painted by talented potters in Mexico.